I’d been trolling websites looking for inspiration, because even though I’ve been threatening it for ages, in the next year I truly am going to revitalize both my websites. Really! But it got to the point where I couldn’t even look at another website. My head was spinning. I was on overload, saturated with beautiful images. Perfectly posed people (in that oh-so-insouciant way). Soft focus. Light flares. Air brushed? At one point I even got confused, thinking I’d landed on a model’s or actor’s home page. I mean, it was all so damn pretty! Clearly, things have changed a lot since I put up my first counseling and coaching website seven years ago. So I was grumbling a bit…(it’s just a f***ing website). And yeah, maybe there was some comparison envy going on too. Not to mention worry about these apparently new website rules (because I can be good, too good, at following the rules). As I let these thoughts and feelings move through me, I noticed something else was there too. I found myself looking down at the parquet floor I was standing on: Old. Imperfect. Scratched. I opened the slider and stepped out onto the deck: Loose boards. Splintered. Faded. I walked out beneath the oak trees: Spongy leaves, sticks, acorns, layered over time. All of it decaying. Finding its way back into the earth. The very ground we walk on, far from pretty. Dirt, in fact. But very real. Right then I knew that it was important to explore this story in the women’s creative wisdom tele-circle that was happening that evening. Everyone in the circle could relate, whether or not they’d looked at a website lately or looked down at the ground they walked on. Because this is an old, old story that goes way back, long before the digital age began. And as we told it again (because we women need to keep finding our way through this story) a question or two bubbled up: What’s underneath the veneer? What are we afraid to look at? What does all this pretty perfection keep contained? What, in a nutshell, is unacceptable for us to do or be? Oh my, did that ever open up some deep conversation and acknowledgement of all that’s down there, held in this particularly pretty and particularly hypnotic shade of shadow. 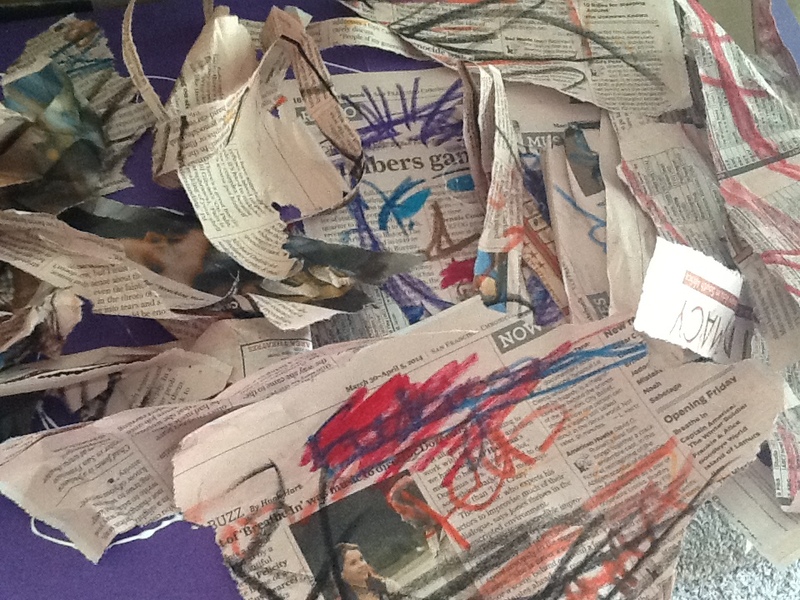 So we grabbed our crayons, four or five in each hand, scraping and slashing them onto newspaper and tissue paper. Shredding, tearing, taping and releasing it all into a shadow collage. That was the moment when I said: Now, go ahead and deliberately draw something ugly…an ugly self-portrait. We all got to it, creating together in real-time. Since this is a tele-circle we can’t actually see what our circle sisters are doing. But there certainly is a vibe coming through. And we certainly can hear each other. At first, there was mostly silence. Then I noticed something more: quiet giggles. Here and there an outright chuckle. It’s safe to say that some hilarity ensued when we went around the circle describing what we’d drawn. Even now I can’t help laughing when I write about my self-portrait: Devil eyes. Another eye in the back of my head. Fangs dripping blood. A witchy, warty, hairy nose. I’m so bummed that I can’t find my self-portrait and share a visual with you. I guess it got swept up with the newspaper recycling, because it was, after all, newspaper! There is freedom in deliberately making ugly art. It releases us from our masks. It opens us up to shadow and makes it not so scary. And when it’s done in a circle of wise, creative women, we can experience it as deep, life-affirming play. So now I’m wondering. What would your ugly self-portrait look like? Want in on the deep play of the Women’s Creative Wisdom Tele-Circles? Space in the circle will open up in early 2015. You can subscribe to my e-letter right here to be the first to get all the details. Patty — As usual a great post. You definitely touch places in the soul that need to be brought into the light. I’m going to have to try this! I didn’t realize you do tele-conferences. Let me know when the next group starts. I’d be very interested in joining one.